It’s important for your children to have well-child exams at least once a year. 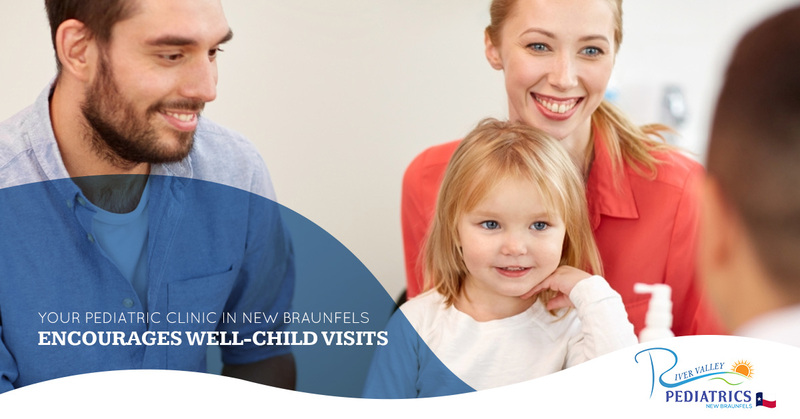 At River Valley Pediatrics, your pediatric clinic in New Braunfels, the doctor can help find problems early, when they are easier and less expensive to treat. We are a full-service pediatric care to kids of all ages. Here are a few reasons why regular well-child exams are so important. Regular well-child exams are a critical aspect of your child’s health care. This type of visit is to ensure your child is healthy and developing normally. This is different than a visit to your pediatrician for an illness or an injury. An important task completed at well-child visits is in the managing of prescription medications. This is an opportunistic time to discuss any medications your child might be taking. This includes questions about dosage and possible side effects. It is important that you follow the directions when giving medications to your children. Immunizations are often given at well-child exams. If not, they can be scheduled as well. Vaccinations keep your children from getting certain diseases and will keep you and your family healthy. If you have any questions about vaccinations, talk with your pediatrician at the next well-child exam. A physical examination usually includes recording weight and height, taking blood pressure, checking on eyes, ears, nose, skin, mouth, throat and teeth as well as checking on the abdomen, lungs and heart. Your pediatrician will use a growth chart to see how your child compares to others of the same gender and age. During the exam, your doctor will ask you about the family’s medical history. This will go in a record of illness and diseases that run in your family. This will help your doctor keep an eye on patterns of chronic illness that may run in your family. These exams are perfect opportunities to get the answers to the questions you have and to garner medical advice. You might wish to talk about disease prevention, nutrition, safety issues or physical fitness. You can even talk about possible behavioral problems, issues at school or any other concerns that you might have. If well-child exams aren’t on your list of top priorities, they need to be. Give River Valley Pediatrics a call today and schedule a well-child appointment.